Photographer Bruce Davidson began the most important journey of his life when he boarded a bus in the American south close to 50 years ago. 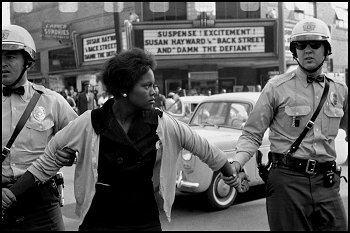 The pictures he took tell us a story of racism and exclusion in America but also remind us how much has changed. Davidson was a passenger with the the Freedom Riders — a handful of young African-Americans and a few white sympathizers who sat bravely sat together in the front of the bus. Many of them were nearly beaten to death by lynch mobs waiting at bus stations between Alabama and Mississippi. The young photographer had already joined Magnum Photos, in 1958, after publishing his first photo essay in Life magazine at age 22. Some 100 photographs are on view, part of two collections entitled Time of Change and 100th Street. Time of Change records the civil rights movement of African-Americans in the 1960's and 100th Street illustrates life in New York's Spanish Harlem. Davidson had met Henri Cartier-Bresson in Paris in 1956. "Let's say that Eugene Smith was my photographic father and Cartier-Bresson, my mother. Bresson was generous in spirit and took life as it came — he never imposed himself in his images. ... Smith worked more like a film director," Davidson said in an interview with the French daily, Le Monde. From 1961 to 1965, Bruce Davidson chronicled the events — in the North and the South — of the Civil Rights Movement. Though the experience changed his life, he never sermonizes. His achievement is the simple but intimate black-and-white glimpse into the lives of African-American schoolchildren, laborers, church-goers and civil rights activists, many of them threatened with violence or arrest. In Davidson's photographs, the Selma March that led to the Voting Rights Act of 1965 seems more like a quiet act of faith than noisy heroism. A woman walking across a field refuses to stop though the police bow her head with a jet from a fire hose. An ordinary couple — two middle-aged black Americans — is shoved into a police van in front of a restaurant. Their crime? A cop scribbles away with a crumpled sign pressed under his armpit: "Khrushchev can eat here. Why can't we?" 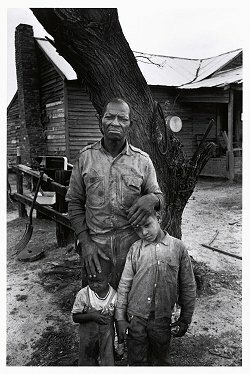 Davidson also lived with migrant cotton farmers in South Carolina and Mississippi, photographing them in the same intimate way. He shows us a child, exhausted by work, crumpled like a doll on a sack of cotton, and an old woman near the end of her lifetime as a fieldhand palming a coin from a white overseer. 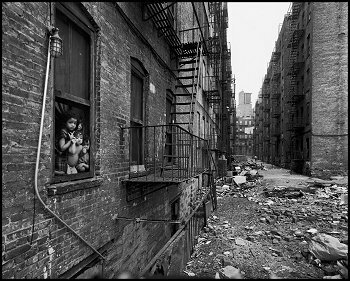 A second set of images, partly intermingled with Time of Change, is dedicated to a single block in Spanish Harlem sometimes referred to in the 1960s as the "worst street in America." Davidson spent two years (1966-1968) photographing the working-class blacks and Hispanics who lived there, becoming an adopted local, the "picture man." He walked the sidewalks, day after day, knocking on doors and asking permission to photograph. There are portraits of a retired cleaning woman scrubbing her own floor. Three generations of women stretched out on the same bed. Drugs addicts in the basement. And three black women getting married in white silk. Davidson would later say that his greatest reward was seeing the residents of 100th street coming to see their portraits during the Museum of Modern Art (MoMA) retrospective of 1970.